As part of our on-going support to coaches and teachers, a series of coaching resources from our manuals can now be purchased online to assist with the preparation of classes and coaching sessions that will challenge and improve students and players alike. The sessions come in a structured format with progression from age 5/6 years through to adult. Rather than having to purchase an expensive manual coaches/teachers can now purchase only those sessions that will be relevant to the age group that they are coaching/teaching. All sessions are easy to download and can be paid for online via PayPal, and will be emailed to you upon receipt of payment. Each session can be printed out or retained on the computer where a bank of resources can be built up over time. This Fundamentals Coaching Resource has been produced by the Ulster Council to help meet the needs of coaches working with young players. It highlights the FUNdamental physical literacy and movement skills that underpin Gaelic Games. The FUNdamentals programme is applicable across all Gaelic sports and will challenge current coaching philosophies and practice on the preparation of our young players for participation in Gaelic Games. It is almost impossible to teach sport specific skills if athletes do not have a good basic foundation of the fundamental skills. Movement skills learnt at these early years become automatic and can be called upon when learning sport specific skills. Ulster GAA has incorporated this fundamental phase into the coaching programmes, to ensure that future stars are athletes and footballers and hurlers. The RJT activities build on the Agility, Balance and Co-ordination skills developed at an early age. 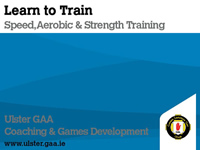 If these ABCs are not fully developed the player cannot achieve their potential in the RJT aspects of Gaelic Games. Understanding the benefits of a good grounding in the ABCs is essential. This understanding allows the coach to link these core fundamental skills into the Running, Jumping and Throwing activities of athleticism. Catching and Passing / Throwing are skills that go hand in hand. These motor skills build on the physical literacy developed through the ABCs and the running, jumping, throwing activities. The next phase after passing a football or striking a hurling ball is the catch. Passes can be made by throwing, kicking or striking with the hand or an implement. Use of different sizes of balls and different implements to strike the ball. This will help players to become familiar with different surfaces and make them more proficient in the use of equipment and the future execution of Gaelic Games skills. Kicking skills would follow handling i.e. throw/catch skills as it is much easier to handle a ball than kick it. The children at this stage should have built up a good movement skills to make the transition to kicking skills much easier. The initial development might involve equipment like bean bags that do not roll too much when kicked. Striking skills should be the last programme of games to be introduced to children because of their difficulty. By this stage they should have acquired a sound foundation of basic handling, kicking and movement skills. This allows the more complicated striking skills to be built on. The first striking implement should be the hand and fist then small bats, longer handled bats and finally sticks. This resource introduces games to challenge the player who is developing FUNdamental skills. A range of non-invasion, part-invasion, invasion and modified games are outlined to assist coaches with the development of their players’ skills. The Learn To Train stage has been divided into two phases, the first at U10 and the second at U12. The first phase will cover the U10’s and focus on children learning How to Play. The second phase will help U12’s progress through to the end of the Learn to Train process. This means these first two stages from 5 to 12 years are structured to maximise participation. and playing performance. This section provides a full range of warm up and flexibility exercises to raise the pulse and mobilise joints in preparation for exercise. Speed is important since players must be able to react quickly (react to signals), move quickly (quick limb movement e.g. kicking a ball) and run in different directions (speed of leg and arms). Speed of thought and body is probably the single most important factor in a player’s armoury. Having completed the fundamentals children are now ready to compete in speed drills. This section provides an overview of the merits of appropriate nutritional intake, hydration for participating in exercise and also an introduction to mental preparation for playing games and participation in competitions. The main objective in this section is to learn overall Sport Skills. This is the most important period for motor development. Early specialisation in late specialisation sports like Gaelic games can be detrimental to later stages of skill development and to refinement of the fundamental sport skills. This is the stage where the children are ready to acquire the general sport skills that are the cornerstones of all athletic development. In this section coaches are introduced to ‘the tricks of the trade’. The ‘how to’ coaching skills that will improve communication and delivery within all coaching sessions are introduced and developed. This section provides an introduction to the technical development of the skills of Gaelic Football. The resource provides basic, intermediate and advanced drills and a number of grid and conditioned games to help further develop the skills. This section provides an introduction to the technical development of the skills of Hurling. The resource provides basic, intermediate and advanced drills and a number of grid and conditioned games to help further develop the skills. This particular manual looks specifically at the Train to Train (age 13 to 16) phase of the FUN to FAME™ model. It focuses specifically on some of the key areas of development that the coach should concentrate on in developing and retaining talented players in Gaelic Games. These resources introduce the coach to the key development areas of conditioning and building core strength. Key areas covered include stamina, speed endurance, strength, speed, suppleness, and the development of the core to optimise the efficiency of the player’s muscular effort. Having progressed from the Fundamentals and Learn to Train phase the young athlete must now focus on the more sports specific in-depth skills of speed and stamina. This resource focuses on the development of all the key areas of speed development and the enhancement of stamina in young athletes. 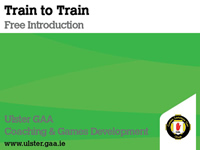 This section will focus on the technical development of Gaelic Football skills and how they can be integrated into the game. The resource looks at the principles of play and provides the coach with a selection of technical development drills and Gaelic Football activities that help to develop the individual players and the team. This section will focus on the technical development of Hurling skills and how they can be integrated into the game. 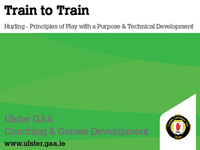 The resource looks at the principles of play and provides the coach with a selection of technical development drills and Hurling activities that help to develop the individual players and the team. A key question in the development of young athletes is when can they commence weight training? 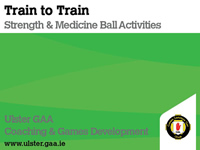 This section will provide the coach with a common sense approach to the development of strength and will expand to provide a series of activities using medicine balls to achieve developmental goals. Lifestyle has become a key component of preparation for all teams. Coaches are educating their young players about the do’s and don’ts of everyday life. Faced with many different choices in life, young people need to be educated as to what are the best choices, and what are the consequences of making the wrong choice. Gaelic Start aims to improve coaching programmes for children up to nine years old and can be used by club coaches, teachers and parents. This resource provides a series of fun filled warm up activities for children up to nine years of age and can be used by club coaches, teachers and parents. This resource will help coaches and teachers identify a number of static and dynamic stretches for children. 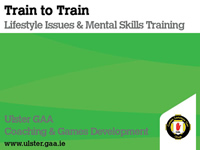 This resource provides easy to understand coaching cards for the development of agility, balance, co-ordination, handling, jumping, kicking, running and striking. This resource is an aid for parents, coaches and teachers which provides 39 fun activities for children to develop their skills and provide links to the school curriculum. 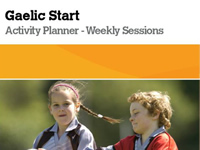 This resource provides a series of weekly planner activity sessions to assist coaches, parents and coaches with their delivery of physical literacy. This resource provides a full complement of games to challenge the skills of children, including – court games, field games, non-invasion/part invasion/full invasion games and also target games. This resource introduces skill games for the development of Gaelic Football and Hurling that will further develop the skills learned in previous sections of the Gaelic Start resources. At Key Stage One we focus on the Primary 1 to Primary 4 (age 4 to 8) when children are developing their fundamental game skills of handling, kicking and striking. A series of eight lesson plans for the development of basic handling skills that target children at each stage from Primary 1 to Primary 4 (age 5 to 8). Including associated tests at each stage. A series of eight lesson plans for the development of basic kicking skills that target children at each stage from Primary 1 to Primary 4 (age 5 to 8). Including associated tests at each stage. 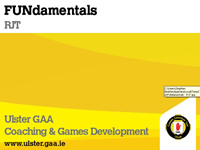 A series of eight lesson plans for the development of basic striking skills, using hand /bat/stick/hurl that target children at each stage from Primary 1 to Primary 4 (age 5 to 8). Including associated tests at each stage. At Key Stage Two we build on the skills learned at Key Stage One to focus on children in Primary 5 to Primary 7 (age 7 to 11) when the games become an integral part of the curriculum and children can be taught sports specific skills. A series of eight lesson plans for the development of Football skills for children at each stage from Primary 5 to Primary 7. Including associated tests at each stage. 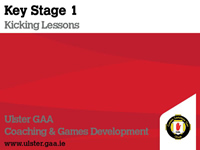 A series of eight lesson plans for the development of Hurling skills for children at each stage from Primary 5 to Primary 7. Includes associated tests at each stage.